More of the best questions answered! Windows and rough openings for a panelized home. Delivery and details of individual wall panels and roof trusses. Assembly of your new panelized home package. Limited building seasons and how panelized home kits can help you. Is a panelized home like a stick built home? Interviewer: Hey everybody and welcome to another episode of the Panelized Prefab Kit Home Building Show. With me as always is the President and Founder of Landmark Home and Land Company, a company which has been helping people build their new homes where they want, exactly as they want, across the nation and worldwide since 1993 and that man is Steve Tuma. Steve, how are things in the world of panelized home building? Steve Landmark: It’s exciting. There’s a lot of things happening, a lot of people building in different areas of the country and under different conditions. You know, hillsides, lakefront and deserts and mountains. It’s kind of neat. Interviewer: And that’s truly worldwide. Interviewer: Which is great. So we’ve been doing this thing which I think has been very successful the last few episodes. I’ve been reading letters to Landmark from customers and potential customers. Steve, if you’re up for that, why don’t we continue that again for this episode? Steve Landmark: Let’s see what you have, see if we can stump them. Interviewer: So this first question is – it goes back to something we talked about on the last episode, about picking a design and plans from your company Landmark and they seem all the plans available from Landmark. And there are how many? Steve Landmark: I want to say 2500 or so in the website now. Interviewer: Wow, that’s amazing. So if I pick one of your plans, can I pick my own windows and doors? I think that’s a great question. So as far as windows and doors, which is one of those little things that people just – they have a taste for and they want – they’re envisioning certain windows and a certain front door, certain doors going from bedrooms and things like that. So picking one of the Landmark designs, are people able to design or pick their own windows and doors? Steve Landmark: Yes, they are and that’s one of the key elements because those are – they do a couple of things. They keep the weather in and out of the house, but they also give a certain look, a certain style. But there’s also energy efficiency reasons for it. So there are different types of windows, wood windows, vinyl windows, aluminum windows, clad windows, and they have different looks, different features, double-hung, single-hung, casement picture windows, whatever it may be. People are able to go through and then decorate the home they want. Some people like the simplicity of a white vinyl. Other people want to have a walnut inside with a brushed antique brass inside hardware. So that allows people to go through and decorate the way it is. Then it also allows them – like on doors. You can have a single door or double doors, sliding doors, French doors and as you brought up, it’s also on the inside. What kind of doors do you want? Do you want solid wood doors? Do you want the hollow core? What type of a feel? That’s a very important decorating part but also the energy efficiency component of it. Interviewer: Yeah. Most people don’t think about that. I mean the aesthetic is what’s important. But to have things functional and to be able to help you keep your – keep the cost down of just your heating and cooling is important. Steve Landmark: So it’s a safety situation around staircases, glass that’s right above the floor, around water and bathtubs, different situations like that. So we’re able to go through and work with you on the design. Another key one is egress and veterans who want a window that’s big enough to open, so a person can crawl out in the case of an emergency of some type. So there’s a lot of details that we go in and help you design it to make sure it’s right. But then you can choose the window you like and for the budget that you want and go through. Let me add a follow-up question to that. Like can I put a big window on a wall to take advantage of a view? You know, the lake, a mountain or a pretty meadow or whatever it is. That’s part of what we can do to help you in positioning the house on a site, so that you’re able to take advantage of the windows that you like, so you can see what you want to see. Interviewer: Right. I didn’t even think about the safety factor. The safety factor is just as important as the aesthetic, in fact more important. That kind of information is what you will get when you contact Landmark because everything about building a new home, it’s not just about how it looks but a lot of other functionality. When someone picks a design from Landmark and then decide what – where they want windows and all the flexibility that’s available through you guys, are the rough openings for windows and doors installed in wall panels when they’re delivered? Steve Landmark: Yes, and that’s very important because not all window sizes are standardized among window manufacturers. People will say, “Oh, I’m just going to use this standard window. Can you put it there?” Well, this manufacturer is this size. You know, someone may have a three-by-five-foot double hung window. The other manufacturer might be three-foot-one-inch by five-foot-one-inch. So even though they’re kind of the same size, it’s a different actual opening. So patio doors and windows, we need the actual dimension. Now what’s good about that is we will supply the plans with the window, suggested window sizes up for what you tell us. So then your window manufacturer or supplier can just go through there and say, “Hey, you need a three-by-five double hung in the window. You need a five-by-four picture window in the living room,” and then they can go through to get that list with the performance values for energy calculations and then also the rough opening sizes and the types of windows, so that we can be sure to put them on the plans and it’s accurate for permitting. There’s something that gets interesting about this. A three-by-five window on a double-hung might need egress for fire. But in a single one, in a single-hung window, that exact window may not need egress. Steve Landmark: So you’ve got to look at the specifics of this and like I mentioned before, if you went and took that window in a bedroom, but then took that exact same window and put it say over a bathtub, by the bathtub, it would have to be tempered glass in case someone was in the bathtub and slipped and stuck their hand down the glass for support. It wouldn’t get sliced. So there’s a little bit of work involved with windows. But we’re fully capable of helping you through it. You just kind of need to let us know what you need and we will design it. Steve Landmark: Well, our customers also like to know what they’re building. Steve Landmark: They want to know what they’re spending their money on. They want to know that it’s done right. They want to see it. They want to control it. That’s kind of the situation is you know that these features are in your home. So it’s easier for you to justify your budget when you know you’re getting a properly-built, properly-designed, properly-insulated house. Interviewer: There’s a letter here from a gentleman who has a lot of different variables. I would like to take them one at a time. He would like to know – and this is pretty much a generalization. How big are the wall panels and how much do they weigh? So when Landmark delivers those wall panels, how big are they? Steve Landmark: Well, generally, wall panels will be broken up depending upon where windows are – you know, openings, windows and doors and corners and things like that. As a general rule of thumb, we try to make them eight to ten feet wide, the longest one being about 12 feet. Occasionally you get smaller ones if you’ve got a cut in the corner or something like that. But generally that’s the way that they are and they can weigh say 200 to 500 pounds depending on the size and the size of headers. So if you’ve got a wall going around a patio door, if you’ve got a six-foot wide patio door, it’s going to be a pretty big wall, seven or eight feet wide, big and with the headers. So something that I should do as a follow-up when we – right before we deliver a home, we supply assembly plans, make sure what each wall panel looks like and where it is placed on the house, along with trusses. So people are familiar with what’s being delivered. Then as the delivery is being made, we send pictures so people can look to see how the truck is loaded. So there are no surprises. Everything is laid out there, showing how the house gets assembled. They will have this information prior to the delivery. They can review it, get comfortable with it, understand it, review it with their framer if they’re hiring someone and that just makes it easier. Interviewer: Right. Now you just brought up something. You said truck. Explain to the people listening how is a panelized home delivered. Can you give us that overall? Put it in our mind’s eye. Steve Landmark: Well, it’s basically delivered on a semi-truck, just like the semi-truck you would see on the highway every day, the 53-foot flatbed plus the tractor on the front. So basically wall panels are stacked like pancakes. Generally eight to ten tall and they’re bandied together. So someone could use a forklift to slide the forks under the bundle of walls, lift them and then move them into position where they will be needed. That’s the advantage of the assembly plans. It will say, “Hey, walls one through seven are on the back of the house.” When you see them stacked like pancakes, you take walls one through seven and bring them to the back of the house. Steve Landmark: The trusses are also bandied together and stacked. So they can be lifted off. They’re stacked like pancakes and then like – you know, say we have to deliver some raw materials, two-by-tens, twelves, whatever it may be, they’re bandied just like you would see in a lumberyard in bunks. So it’s a very clean process and we stack the truck and make it easy. A lot of people ask, “Hey, is it loaded in the sequence that I will need it? Can you keep the truck there?” The idea is to get the truck out of the way, so your framing crew has the space to work around it. Steve Landmark: But the bundles will be stacked in a sequence that they will be used. Occasionally, there’s an odd size or something that has to be out of sequence. But generally, they’re stacked, so you can look at it and say – like I mentioned, walls one through seven are on the back. Walls eight through twelve are on the side. You could put them in locations where it’s convenient for framing. So it’s not a flatbed truck. We deliver as close to the foundation as we can get. We have to be safe of course and make sure the road is passable. But we’ve been able to deliver all around the country in mountain areas, cities, rural areas, wherever it would be. Interviewer: It just sounds like a big puzzle, but it sounds like an easy puzzle. Interviewer: How much fun is that? Steve Landmark: Yeah. They said this is amazing. Interviewer: Well, let’s follow up on that. How many people does it take to assemble a Landmark panelized home? Steve Landmark: Well, generally, we suggest that you have one knowledgeable framer that understands the concepts of framing and then a couple of laborers. Depending on site conditions, you can have two people or three people. Sometimes people try to get five, six, seven, eight people. But there’s a certain point where I think it’s a little bit too much. So I would say three to four people. You know, with one person being a – understanding the framing concepts. Steve Landmark: Then others kind of just being labor and muscle to help put things in place and we suggest people get some equipment. You know, maybe a forklift or extended reach forklift or something to help move – unload the truck and then move the materials around the site. Steve Landmark: You don’t really need a crane. Cranes generally cost more. It’s a more specific operator. In general, the cost of a crane for a day is what a forklift or an extended reach forklift would be for the week. So unless you have a site that requires a crane, you’re on the side of a hill or just – there’s something in the site that doesn’t allow the maneuverability of a forklift or an extended reach forklift, a crane could work. But that’s more site-specific. Now there’s other points. If you’re building a big three-story home, you might need something with a longer reach. But most homes, you could with an extended reach forklift. You can get the panels up there. The roof trusses up there and make everything happen. So some people just manhandle them. We always say, “Hey, get the equipment. It’s probably safer, faster and easier and it’s a lot of work assembling the panels.” So the equipment I think will make it go a lot quicker and be easier overall. Interviewer: Here’s a question from a lady. It sounds like she has done her homework a little bit. Dear Landmark, how do I decide between dimensional wood floor systems and I-joist or a floor truss system? Steve Landmark: That’s interesting because that depends on the use and your intended need. Dimensional wood is like a two-by-ten or two-by-twelve. Well, those are solid pieces of wood. You can’t really drill through them. You might be able to drill an inch or two through there, but you can’t really run duct work through them and they’ve got a limited span. I-joist, it’s an engineered wood, kind of like a piece of OSB with a block of wood at the top and bottom like an I-beam. If you were to take a slice of it, it would be like an “I”. Those are engineered and they can have a longer span. OK? And then the open web floor trusses, they’re a web. So you can actually pass duct work, plumbing and electric through them and they again can have a longer span. So the point being is what are you intending on doing. So let’s just say you were building an affordable ranch on a crawlspace. The most affordable way is to go with a dimensional wood, like a two-by-ten. Interviewer: Sounds like my kind of home. Steve Landmark: Well, Steve, all of us have been in the home where there’s a post and no matter where the post is, it’s in the wrong place. Steve Landmark: So what that bigger span of the I-joist does is it eliminates beams and posts, making for a bigger open area, like in a basement. But not just the basement and great rooms. You know, in upper level floors as well. So it provides a span. Now the floor truss is open web, so you could pass the duct work through. So let’s just say you had eight-foot wall in the basement. Using an I-joist or dimensional wood, you would have to hang the duct work below it. So maybe by the time you box in the duct work, you end up with a seven-foot ceiling. Steve Landmark: Well, with the floor trusses, you can run the duct work through the trusses and with an eight-foot wall, end up with a little bit under an eight-foot ceiling. You have to consider the floor slab. So I’m using rough numbers there. So that’s the point is it allows you to run duct work and plumbing through there. So it’s a quicker, easier assembly not just in the wood structure of the home in our panelized package, but also for plumbers and electricians and heat people. So it really comes into what’s your intended use and the design of the home. If you have big, open areas, you’re more likely to use an I-joist or a floor truss. Steve Landmark: And the cost goes up a little more for each one. But there are cases where the cost isn’t significantly different for the design. So it’s – those are the basic situations of how big of an area do you have to span across. Then we could determine the system and that’s what we can get involved to kind of work with you to say, “Hey, this is where it makes sense under these conditions. This is where it makes sense under other condition.” So it’s a – but that’s what we can do to help you. That’s a key element. That’s a good question. It’s a little deeper than most people understand. But as people learn things, they’re asking that question more and more. Interviewer: Like I said there, people doing their homework. So yeah, it’s – do a little investigation on your own and you can ask more intelligent questions, which is always helpful. You know, we’ve kind of touched on this before in past episodes. But we talk about getting our design, deciding on the design of the house. If I want to make changes to my panelized home during the design and then the building process, can I make changes to my panelized home? Steve Landmark: The answer is yes. The situation though, the deeper answer, is we should look at the conditions. If it’s in the design process, the preliminary plans, where we’re just working the design of the home – you know, where do you want windows? How big do you want rooms? What do you want the house to look like? It’s real easy to change it on paper. Once you get into the engineering phases, it gets a little harder to do changes. But it’s still possible if absolutely necessary. It gets to a budget point and a sensibility point. Changes during the construction will delay your schedule and it will also cost more in any building system. No matter what you use, that would increase the cost. So that’s why we say let’s do all the changes on paper. It’s easy to say, “Hey, let’s add a window. Let’s move a door. Let’s make the house a foot bigger.” Once the house is assembled, it’s just like a stick-built home. Yes, you can do changes. It’s just you have to realize that some things are already there. You got to remove it and then you’ve got to replace it. So it’s going to hurt your schedule a little and it’s going to cost you a little money. So it’s wood. It can’t be changed. That being said, some people think the nature of building is doing changes. They say that’s part of it. Well, that’s also a big part of the reason why people go over budget, because of the cost of the changes. Steve, it’s the same thing if you went to a restaurant. When you’re looking at the menu, it doesn’t really hurt anything. If you say, “Oh, I want the spaghetti,” and then you change your mind to the chicken, well if you ordered it, the cook is cooking your food. It’s a little bit harder to change, much less as when it’s delivered to your table. You say, “Hey, that spaghetti looks great. But now I just have a taste for chicken.” It’s extra money. It’s extra time and it goes there. So to avoid those problems, we tell and suggest people that they take the time to understand their design and make sure that it’s right. Steve Landmark: Because the changes, yes, they can be done. It’s just it’s a little bit awkward to do it. So if you can avoid it, it’s possible. There are people out there that say, “Hey, I heard panelized homes can’t be changed.” Yes, they can be changed. It’s just like a stick-built home. You can change it. It’s just like anything. Once you’ve done a process to go back and redo it, it can add complexity. Let me add one point. It depends on what you’re changing. If you said, “Hey, I’ve got an interior wall that’s 10 feet wide and I’ve got a three-foot door in the middle. I just want to move it six inches,” that probably isn’t any big deal. Steve Landmark: But if you said, “Hey, I need to add another wing to this house,” it’s more work to do it. So it depends on what it is. We will be as accommodating as possible. But it’s always good just to do – as we say, do your homework upfront. Design it right and then built it. You will control your schedule, your headaches and your budget a lot more. Interviewer: Controlling the headaches is the most important thing. Interviewer: Here’s a question. Dear Landmark, I live in the mountains in Colorado, an area with a limited building season. How would a panelized home help me? Steve Landmark: Well, that’s really interesting because Colorado has got a lot of seasons and some of the higher elevations. The snow flies in fall through beginning of summer. Steve Landmark: And get your choice of contractors because they’re not as busy. You know, in areas where the climate gets colder. So your ability to control the schedule is very important, especially in the places with a limited building season. Interviewer: Wow, there’s so much – just so much to know and it’s crazy. Landmark, it just seems like the way to go. You guys seem to have so many answers. Just the little things. It boggles the mind, the little things that you have to think about when you’re building a house and it’s really nice to know that there are companies like Landmark. You guys are there to answer so many questions. It’s great. There’s one last letter I would like to get to here. It’s a pretty simple question. Dear Landmark, is panelization just like a stick-built home? Steve Landmark: Yes, it is. In fact, it’s a more efficient method of stick-building. What we’ve basically done is taken the same concept. So if you take a wall panel – if someone was stick-building, meaning getting the sticks, the two-by-sixes, the two-by-fours and so on, getting them delivered to site, cutting them, building a wall and lifting the wall up, they’re doing a lot of work on site potential for lower quality work just because of work conditions. You’re working on the ground or in areas where it’s just not an optimal place. You’re affected by weather. People make mistakes. They cut boards and then you need another one. There’s generally a lot more waste. What we’ve done is we’ve taken that process of building the wall panels in sight, in a controlled environment, so that all those details can be put together and then we deliver the wall panel to the site and it’s put up. So a lot of stick framers will be like, “I’ve never done a panelized one.” Well, you have done panelized if you’ve done stick-built because you’re making your own wall panel and then lifting it in place. The difference is we’re pre-designing it. So you’re not out there having to cut and measure and do as much cutting and details. Everything is there. So you just assemble the walls and put wall one up, wall two up, wall three up. You know truss one, truss two, truss three. So you’re assembling. So it’s much quicker. So just like a little bit earlier in this conversation, a retired couple of the Upper Peninsula of Michigan, husband and wife, decided to put a couple of walls up. I think they said they did the back half of the house in an afternoon and they were just happy taking pictures of each other. Steve Landmark: You know, putting it up. So when you look at the speed of assembly, it helps because there’s labor shortages. Some framers aren’t as qualified as others. This allows you to get your house built under a controlled situation and a controlled budget. That’s the key element. So it is just like stick-building. It’s just a more efficient process and it’s a more controlled and more cost-effective process. Interviewer: It’s funny. This is something that I’ve never brought up in the podcast before. But whenever we’re talking, your passion and your excitement about seeing people getting the new homes, getting into their dream homes, it’s just amazing. It seems to me like you and your brother Mike, who helped you build the company back in 1993, you guys both have this sort of personal interest in seeing people get what they want. I think that’s great. Steve Landmark: Or hey, my husband did this or hey, my wife did this or hey, we – we put all these different details into the home. There’s one family. I got a picture. It was one of the most interesting pictures. She sent a picture of daffodils that his grandfather planted in the ‘50s. Just this yellow field and it’s there with the house. So you start looking at this. It’s not just a house, like hey, a place to stay warm. You’re affecting people’s lives. Steve Landmark: As people retire and they still want a home office for a little retirement job or as people telecommute, as millennials need different working conditions, as people live in different ways, it’s kind of the dining room is taken away to the game room, to the great room. So it’s interesting to see what you can do and – one of the neatest things, we just got a picture from a family building in Anderson Island, Washington State. A lot of people are building homes and their kids are involved. Steve Landmark: So you see a 70-year-old, a 15-year-old, a 12-year-old. See this? The organizational knowledge that they gain? The working with the family? The pride that this is my home? I bet that kid keeps his room a little cleaner when he built the house. You know, than if he’s just thrown in some apartment someplace. Interviewer: I will bet. I will bet. Steve Landmark: And then a lot of people have active lifestyles. So that particular home on Anderson Island, the walkout basement is kayak and canoe storage. Steve Landmark: So you can just run up and down to the water and have your stuff and have it secure in there and then other people are into skiing or any of the outdoor sports and they need a certain garage for whatever hobbies they happen to be or craft rooms or porches overlooking it. So it’s important to have a house. But to have an environment that you truly enjoy living in, that’s a whole different world and that I think is why people enjoy working with us because if they want to do changes, we don’t sit here and say, “Oh, it’s another $4000 to do this.” It’s like, hey, let’s change it. We’re in the preliminary plan stage. Let’s move that window to take advantage of the view. One of the neatest stories I had from a guy in Arizona. Leroy, he said, “Steve, I’ve been married 50 years and I promised my wife that I’m going to buy her a new home.” He said, “I just turned 78. I better get it for her.” He got the garage and the porch, so they could look over the land and she wanted a kitchen laid out a certain way with windows in the corner, so she could look over the land. Apparently she’s a master pie cook – pie baker, sorry. So this house was designed around him goofing off in the yard and playing with his toys in the garage and her baking pies. Interviewer: That’s great. That’s the best. Steve Landmark: So he said, “Seventy-eight years old,” and I was like, “Wow!” Energetic, happy. I get Christmas cards from him every year. It’s amazing. That’s one of the most amazing things out there. Interviewer: Well, that goes back to the passion that you guys have. I mean that’s testimonial right there people. They’re following up with you and keeping in touch with you and showing you the flowers they’re growing around their new home and sending you Christmas cards and you guys should be proud of that. That’s really amazing. Steve Landmark: It’s amazing and then when a customer calls back after 10 or 15 years and says, “Remember me? I want to do it again,” like yeah, let’s do it! Steve Landmark: Let’s go have some fun. Interviewer: All right. So we’ve come to the end of another podcast. But before we sign off, Steve, once again please give us the lowdown on how we can connect with Landmark Home and Land Company and basically where we go for all the information. Steve Landmark: Yeah. It’s very easy to get in touch with us and yes, we are responsive. We answer phones. We return emails and if you do get a voicemail, we will call you back right away and get you taken care of. But the key to it is you can call us at 800-830-9788. You can look at our webpage at www.LHLC.com. That’s the initials of Landmark Home and Land Company, www.lhlc.com. You could submit an inquiry through there or you can email Mike at mike@lhlc.com or email me Steve at landmark@lhlc.com. Interviewer: That’s great and yeah, I just always enjoy these talks we have because I learn so much and I get excited just hearing about other people building their new homes. It’s inspiring. So congrats on all you guys are doing over at Landmark. 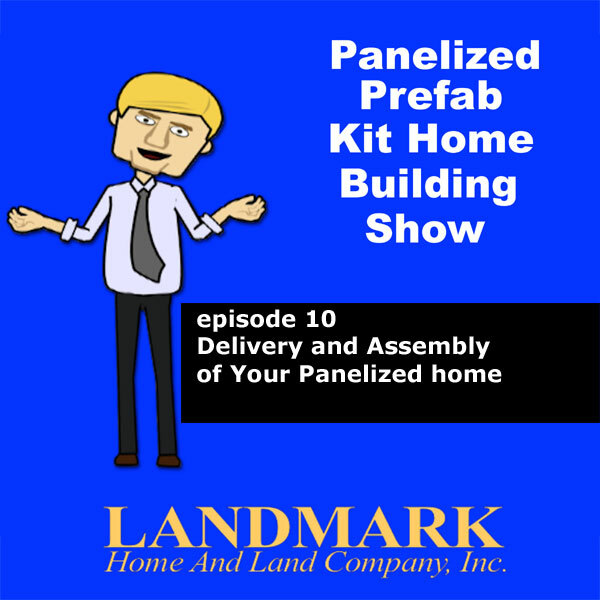 Interviewer: Well, that’s it for this episode of the Panelized Prefab Kit Home Building Show. So for Steve Tuma and myself, thanks again for listening everyone and we will see you next time. Steve Landmark: Have a great day.